The American sound artist Zan Hoffman impressed us greatly when we heard just one tape of his called Zanstones Fur Berlin, released by Staaltape and noted here. 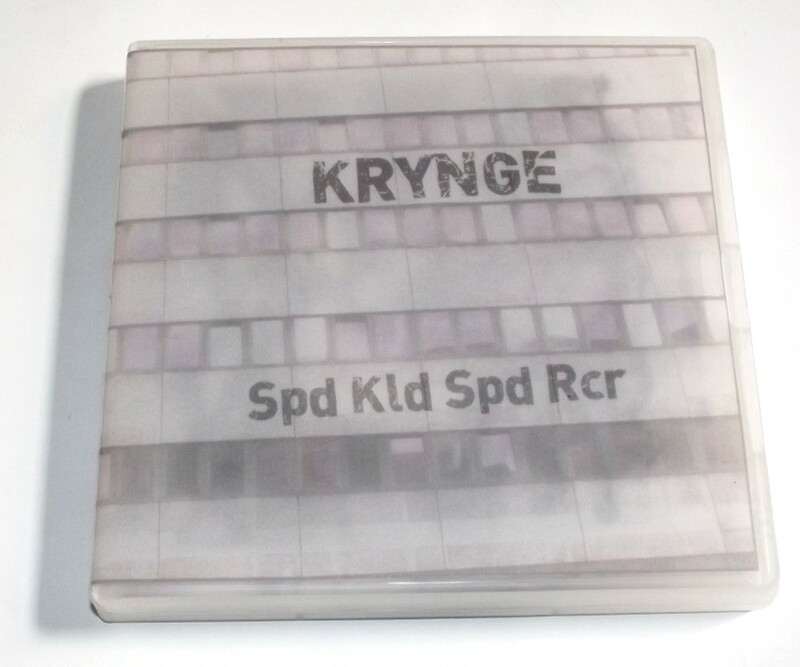 I now learn that another one of his many guises and projects was Krynge, described as a “mutli-collaborative international supergroup” which he masterminded in the years 1987-88, and the CD Spd Kld Spd Rcr (ATTENUATION CIRCUIT ACR 1012) represents the first time that a Krynge cassette has been reissued in digital form. I would guess that Zan produced it by layering and reprocessing contributions from the other home-taping collaborators – Agog, Minoy, and Swinebolt 45 – who were presumably part of the Krynge cabal, although it’s described here simply as “reimagining”. Much to Zan’s credit, he did it all with a four-track recorder, and I agree whole-heartedly with the sentiment that declares he is using the technology as a compositional tool. He succeeds in creating a delirious whirl of sonic information, absolutely teeming with life and vitality and mad ideas rushing past at speeds of mach number. Amazingly, it seems that much of the original source material is recordings of contorted speech, where the speakers themselves – presumably Agog and company – are doing everything possible to distort their own voices, without the aid of technology. They are simply speaking in a weird way. Without exaggeration, it’s fair to state that Hoffman unleashes the hidden inner power that is inherent in everyday events, re-presenting the world as an incredible powerhouse of seething energy. While this raging force may at first at seem a storm of chaos and randomness, you should try and calm down and listen out for the loops and repeated elements which will serve as anchors or index points. And though it may also seem to present a scary view of an unfamiliar world, it’s not an outright evil sound – Zan is not on a mission to terrify us or destroy normality, rather perhaps to reinvigorate our sense of the breathtaking beauty of humanity, of the creation. In that regard I would liken him to Aki Onda, even though they probably use quite different methods, since they seem to share common ground on the way that magnetic tape can not only capture amazing things, but then make them seem even more amazing through distortion and playback. Dreams made into the concrete…since we last wrote about Hoffman and his ZH27 label, it appears he has now made his catalogue freely available here. 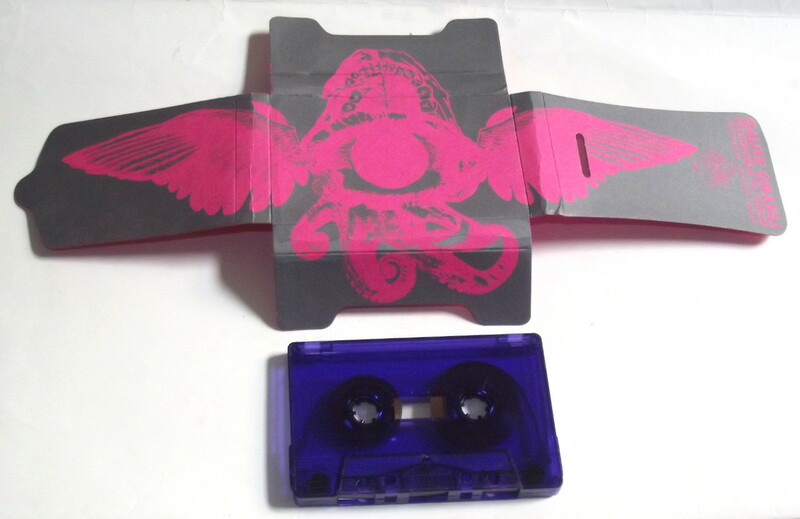 Norwegian noisester Gaute Granli is the guitarist and vocalist in Freddy The Dyke, a duo which we mentioned recently in our round-up of Drid Machine tapes, but he’s also made a solo tape called Velkommen Til Forus (SKUSSMAAL SKUMC01) in an edition of 50 copies, which he kindly sent us on 26 November 2013. Where Freddy The Dyke by and large aim for a wholesome and joyful sound experience, solo Granli is much more fractured and inchoate by comparison, with a sense of lumpy ugliness informing each turgid groan. He moans vocally and wordlessly into an echo chamber with sinister intent; his guitar throws out shapeless strums and aimless riffs like a baboon casting coconuts from a tree; and percussion effects stumble blindly about the room like a hooded goblin. When a synth or other electronic keyboard joins in the fun, it’s as though the machine has been possessed by the spirit of Jerry Lewis, or other zany knockabout comedian. This release may not be much more than a chunk of studio doodling and pottering on behalf of Granli, but it’s spontaneous, good fun, and not weighed down with any grim aspects we’d associate with portentous industrial noise. Nor does Granli let any nonsensical concerns about editing, production values or retakes spoil his larking about. As such, we like it fine. Another fine item from Arturas Bumšteinas, already noted earlier this year with his concept album themed on “Sleep”. 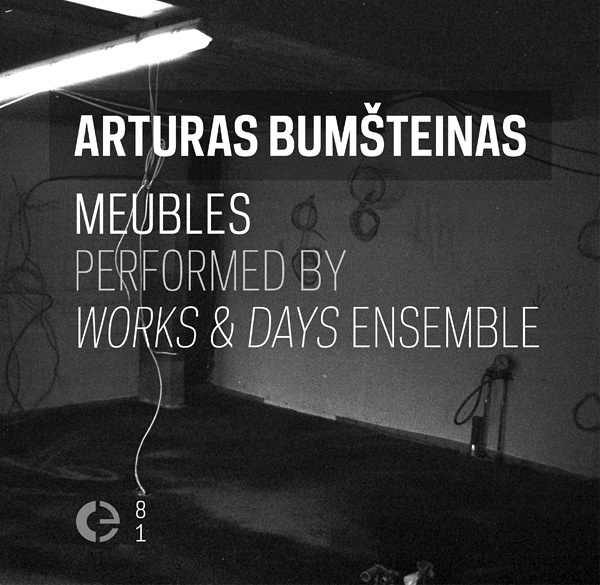 For Meubles (CRÓNICA 081-2013), he’s enlisted a small ensemble of players from Poland and elsewhere, called them the Works and Days Ensemble, and commissioned them to perform the three suites of music. Meubles is a concept album about “furniture” 1. By way of underpinning the project theme, each musician was asked the poignant question “If music could be furniture, which piece of furniture it would be?” Their replies – all very imaginative, individual and personal in their interpretation of this vague and open-ended question – result in an almost surrealist catalogue of objects, including a wine cabinet, a stove, a bed, a window, and (my personal favourite) a Billy bookcase from Ikea. It’s my guess that these responses have been the basis for the score of the Meubles suite. I’m all in favour of using unconventional methods to fuel the generation of music. If Stockhausen could write prose instructions for his players for Aus Den Sieben Tagen, then why can’t Bumšteinas get his players to concentrate on a piece of furniture to help them focus on the music production? As the Ensemble perform their (semi-improvised?) parts, the instruments – brass, strings, piano, guitars, percussion and organ – all wrap around each other with the intimacy of a fitted carpet lying snugly in place in a well-appointed room. There are no patterns or melodies that I can discern, but the continual music does hang together in a very harmonious and pleasing manner; no hideous discordant moments await the listener. Slow and syrupy it be, but certainly not formless drone. It’s nice to hear such concord and agreement between people, and it all conveys the pleasant sense of stability that you might associate with a good armchair. From November 2013.